Country and location of the accident. Insurance policyholder’s contact details (Green Card box 9). Vehicle registration number (box 5). Insurer’s contact details (box 10). Green Card and insurance policy number (box 4). 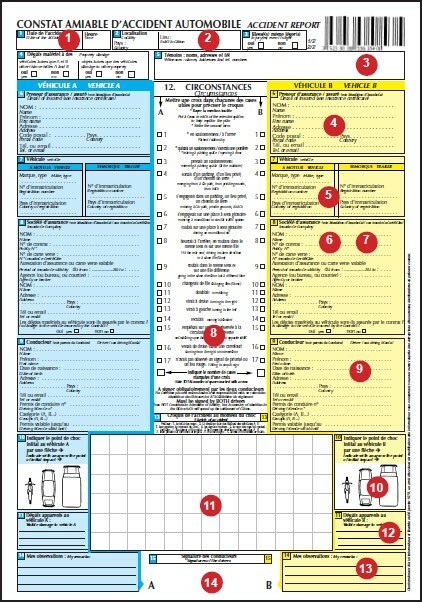 Tick the boxes corresponding to the circumstances of the accident: Tick only the boxes in your column (A or B) corresponding to your circumstances and not for the other vehicle. Driver’s contact details (not necessarily the policyholder). Mark the point of impact on each vehicle with a cross or an arrow. Sketch the accident, showing the road, the traffic direction, signage, road markings, etc. Specify the material damage resulting from the impact. Make any comments clarifying the circumstances.